On Saturday, hundreds of families headed to P.S. 40 for the school’s first Maker Faire, organized by the PTA. The event, done in coordination with Salk School and MS 104, included a Junior Chef competition and activities for children like robot building, Battle Bots racing and stuffed animal making. The Junior Chef event proved to be a big hit among event goers, who crowded the school’s auditorium for judging. A chef who works with the school on a wellness committee, “Chef Jenny” Ecclestone, said the contestants, who’d already made it to a finalist round, had presented vegetarian salads. The winning entry, a kale salad, was prepared by Leyli Colley. In the coming 2016-17 school year at P.S. 40 elementary school, assistant principal Stephanie Lukas will assume the role of acting principal while Susan Felder, the current principal, takes part in a year-long fellowship program. Daria Agosta, a fifth grade teacher, will take over as assistant principal in Lukas’s stead. Lukas and Felder knew each other before Lukas interviewed for the job of assistant principal at P.S. 40. When Lukas was working at P.S. 165, Felder worked at a school nearby. Felder worked with new teachers as a literary staff developer, so she would sometimes bring new teachers into Lukas’s kindergarten classroom to observe. 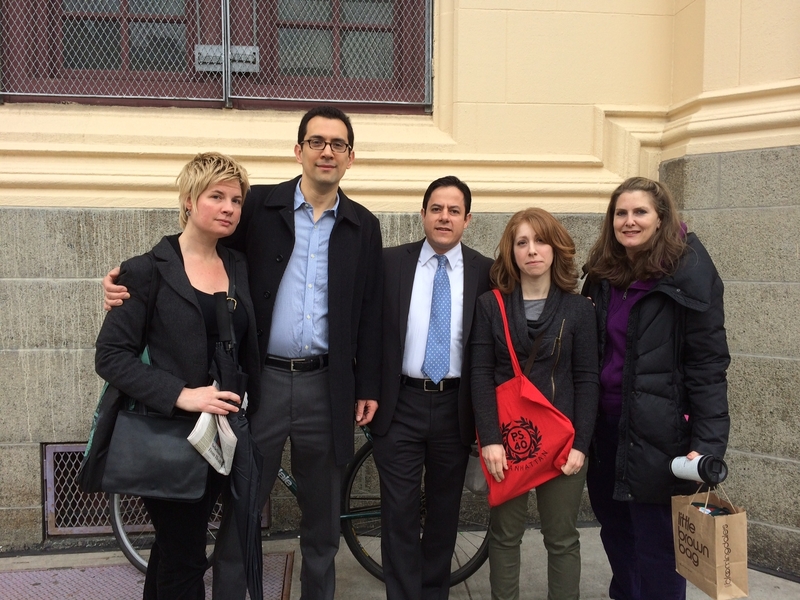 When Paul and Allison Walsh sent their daughter Jane to PS 40 for pre-K in 2003, they never thought there would be any problems sending the rest of their children there, especially since they haven’t moved from their apartment at 17 Stuyvesant Oval in 18 years. But now that their youngest daughter Nora is going into kindergarten this coming fall, the family has discovered that there won’t be a spot for her in the popular elementary school because, even though their address was in District 2 when they moved into their apartment, they are now in District 1, according to information from the Department of Education. In between their oldest and youngest daughters, the Walshes had a son, Gavin, and the first signs of zoning troubles appeared when they tried to enroll him in the school in 2007. Although it wasn’t a problem for Jane to gain admission, Paul said that when they sent in the application for Gavin, they received a call from the school’s principal, noting that 17 Stuyvesant Oval was no longer in District 2. They were able to get a zoning variance for him to attend because their daughter was still enrolled at the time, but since their son graduated from PS 40 in June 2013, the system effectively views them as a purely District 1 family now, even though Paul noted that they’ve spent the past ten years building relationships in the PS 40 community and have had two children in the school. Although the zoning line between District 2 and District 1 for elementary schools seems to fall evenly at East 14th Street on the DOE’s online maps, the reality is more complicated. The line actually cuts through Stuyvesant Town around East 18th Street, putting a number of buildings in the complex in District 1 with the majority in District 2. A memo that the Department of Education released in 2007 further complicated the line, noting that the DOE had been using incorrect information to make school assignments since 1984 for certain buildings in Stuyvesant Town. The memo said that the other odd-numbered buildings in 11 to 21 Stuyvesant Oval, which had been incorrectly assigned to PS 40, were actually zoned for PS 19 in District 1 and that the odd-numbered buildings in 239 to 273 Avenue C, also previously assigned to PS 40, were zoned for PS 61 in District 1. Following the lead of a principal in Brooklyn, who held a protest outside her school over state English language tests that have been blasted as unfair, other schools have followed suit, with parents organizing similar protests on Friday morning. At the heart of the matter, frustrated parents said, was that the recently issued tests had nothing to do with the Common Core curriculum students have been taught and had age inappropriate questions. Additionally, in some cases, a multiple choice question would have more than one answer that seemed like it could be correct. There’s also been a lack of transparency, test critics have charged, with no one allowed to see the tests after they’re taken. Yet another complaint was there was product placement in questions, with references to brands like Nike, Barbie and McDonald’s. Council Member Dan Garodnick was also on hand, saying he too wanted the state Department of Education to make the test available to see. “It will help create a better test in the future and reduce the enormous stress on kids and teachers if they know what this is supposed to be like,” he said. PS 40 PTA Co-President Kirstin Aadahl, who has a daughter in kindergarten at the school, said she hoped to see some change by the time her child is old enough to be taking the state tests. “I don’t want her to be studying for a test that’s meaningless,” said Aadahl. Last year the test had similar problems, she added. “PS 40 did well but many scores went down.” Then this year, teachers were told not to “discuss specifics” of the test. Students take the tests in English language as well as math. The math tests are scheduled for April 30, May 1 and May 2. The tests don’t factor into students’ grades, but do have an impact on how teachers and schools are evaluated and also could help determine what middle or high schools a student is next placed in. Yet another parent, Deborah Koplovitz, slammed the test as being “a complete waste of energy” and said school funds should be spent elsewhere. “There should be more teachers, more paraprofessionals, more nutrition assistance for schools that make it better for children to learn,” said Koplovitz. particular test, which was contracted to a firm called Pearson. Another protest-site school was PS 59 on East 56th Street, which like PS 40 is in Education District 2. 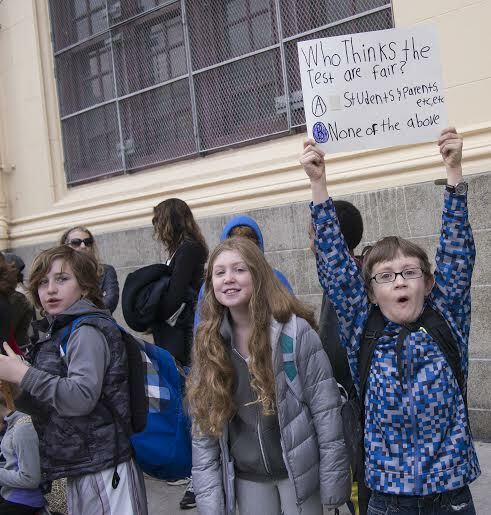 That school’s principal, Adele Schroeter, had penned a letter along with another principal, Lisa Ripperger of PS 234, after tests were taken, urging other schools to participate in the protesting. In the letter she noted how few of her students opted out of the test this year, since administrators had felt confident that the test would be improved following other problems with the test given last year. But, she said, it wasn’t. A spokesperson for the state Department of Education did not respond to requests for comment on the protests. While not done at every school, the protests may also be a sign that educators are no longer afraid of retaliation if they’re openly critical of an official policy. At least that’s the opinion of Shino Tanikawa, the president of Community Education Council District 2. Taste of Gramercy, the first food tasting event to be held in the neighborhood on Saturday, was a success, with organizers selling over 400 tickets. While the nonprofit group that organized it, Gramercy Neighborhood Associates, wasn’t yet sure how much had been raised, since some tickets were $30 while others were $40 depending on if they were bought early or not, the event’s turnout exceeded expectations. “People seemed to like that everything benefits local schools,” said GNA member Gary Horowitz. Money raised from tickets will go to two local schools, PS 40 and School of the Future. For the price of a ticket, guests got to try five tasting plates of food from any of the 20 participating restaurants, with the event held street fair style under an open sky. Anyone could walk into the blocked off area, which was on one block on Irving Place, though to try the foods, guests had to have a ticket. Some of the culinary offerings included tuna tartare cannolis from The Stand, compressed apple with smoked tomato from Gramercy Tavern, paella with shrimp from Casa Mono, oyster shooters in a chilled coconut ginger soup from City Crab and raw macaroons and other desserts from Pure Food & Wine. Paul & Jimmy’s was a popular stop with guests getting their plates loaded up with helpings of meatballs, gnocci and eggplant rollatini. The event was coordinated with the company PTG, which has also organized events like Taste of Sutton and Taste of Tribeca. The vendors also seemed happy with the event, which they donated their food to. Adele Carollo, general manager at The Stand, a comedy club and restaurant on Third Avenue, said the event was a good opportunity to showcase the club’s menu, since most people don’t think of comedy clubs when considering where to go eat. Eric Sherman, owner of the new Irving Place restaurant Ichabod’s, said it was a good opportunity to market the business to area residents as well as for the restaurant community to network. GNA board member Antonella Napolitano said the only downside to ToG was that a couple of local restaurant owners ended up feeling slighted when they weren’t asked to participate. However, she said this was only because the organization was limited to one block for the event. “We’re probably going to expand it next year,” she said.